Hello my dears, I’ve been gone a bit. Did you miss me? As I mentioned before Shawn and I spent the majority of last week at AFI Fest. We saw over 14 films and a handful of shorts. It was a transformative experience for both of us. Even though we were still here in Los Angeles, we were transported to the dream world of cinema for a week. We saw by far some of the best films I’ve seen all year and in the theater surrounded by people who love film. It was inspiring to say the least to be able to see such touching films with honest and creative storytelling. I feel so lucky to have been there. The coolest thing was that the whole thing was free and open to the public. While some screenings, like the gala events, were harder to get into, nearly everything was easy for the public to see. We did manage to get tickets to the gala screening of Shame shown in the majestic Grauman’s Chinese Theatre (where Shawn worked as a projectionist back in the day). It was touching to see the director, Steve McQueen, nervously repeat how big the theatre was. As the movie started, there was murmur of crunching popcorn and it hit me how important it is to see movies in the theater with an audience on a gigantic screen. There’s something powerful about seeing a film with others, something about experiencing it in a group that is untouchable and important. The whole experience really lit a fire in my heart to be true to my love of film in whatever form that may take. And I have some ideas. Over the next week I want to share with you some of the films that I saw that I believe are not to be missed. I’m not here to critique them, I just want to give some attention to the ones I thought were truly amazing. The Voyagers by Penny Lane is a beautiful piece about space and eternity and love and the unknown. The film is constructed mostly of amazing stock footage from NASA overlaid with a narration by Penny Lane. I found it captivating and touching. It has the perfect balance of beauty, science and romance that makes me swoon. Lucky for you, you can watch it above. I hope you love it as much as I did. Last night we went to a special screening at Cinefamily showcasing some of the work of Pablo Ferro. 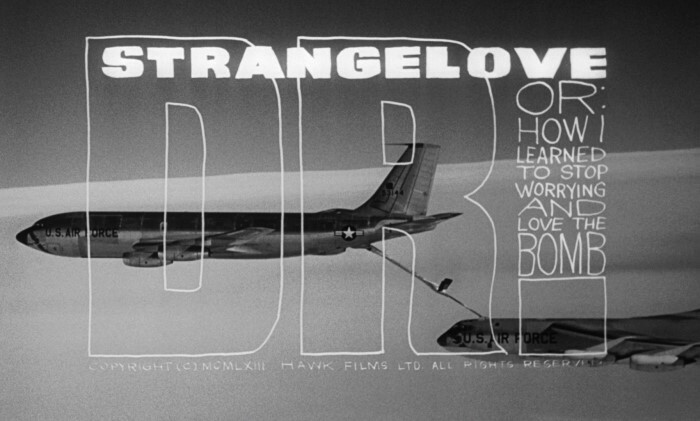 We were just blown away by how superb his trailer for Dr. Strangelove is. It was so cool to hear him speak about his work and experience. He even told us about the one tiny spelling mistake in the Dr. Strangelove titles that lives on forever. But now you should watch the trailer…in full screen please. His titles and trailers feel so contemporary now, but were groundbreaking in the 50’s & 60’s when they were released. When looking at the title sequence for The Thomas Crown Affair, I can’t imagine how much more complicated it would be to create the entire sequence optically on film. His split screen of the polo scene from the film, seen below, at one point has 60 different frames of film all placed into one 35mm frame by hand. Make sure to watch it in full screen. It’s true that really exceptional design is timeless. Dr. Kleinenensteinen Deleted Scene from Shawn Bannon on Vimeo. Why hello dear readers. I’ve been strangely absent from the internet recently. The past few weeks have been painfully busy (at work, how boring) and I’ve needed every free moment for mental recovery rather than fun things like blogging. As a peace offering, or a special treat, I offer you this lovely video made long ago by my dear husband. It’s a deleted scene from Dr. Kleinenensteinen, a film he made (that I’m hoping he’ll share with the world someday) way back when before we knew each other. Sometime soon, when I get around to giving a little tour of our home, you’ll see bits and pieces from this project all around. We live in fantasy land. Hope everyone has a wonderful long weekend filled with end of summer goodness.